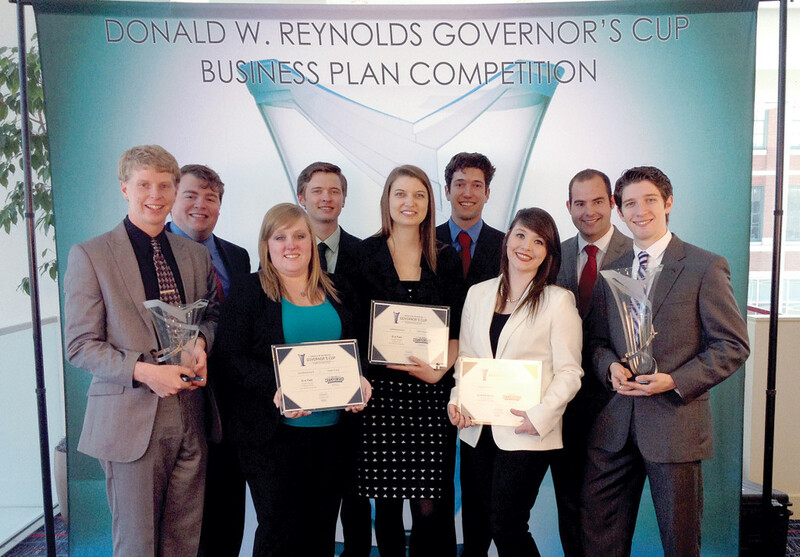 John Brown University teams took home first and third place in the undergraduate division of the Donald W. Reynolds Governor’s Cup business plans competition. The ceremony was held in Little Rock on Wednesday. JBU teams won $35,000 in prize money and the first place team will advance to the Tri-State competition in May. The JBU business plans outlined enterprises in customizable dolls and new business funding. Undergraduate first place: Arleesa: Jeremy Enders, Andrea Good, Chase Skelton, Jake Wilson. Arleesa seeks to provide families engaging ways to craft custom products with their children, centered on the core values of: character, self-esteem, diversity, imagination and fun. Funding Fathers uses the power of The Crowd to equip businesses with funding and customers. JBU had three of the top six teams in the competition finals. The University of Arkansas, Hendricks College and Harding University were also represented in the undergraduate top six. Pictured: Front Row: Jacob Moore, Shantelle McHone, graduate assistant, Eva Fast, JBU instructor of business and team adviser, Andrea Good and Jeremy Enders. Back Row: Chris Hembree, Timothy Luff, Chase Skeleton and Jake Wilson.